About a year ago, my girlfriend went vegan and looks ahhhmazing, so is a vegan the best diet for women? I know this has happened to you too. Your girlfriend finds something that works wonders for her and you think: should I be doing that? This friend of mine went vegetarian first and then now full raw vegan. She also is a spin class junkie which is pretty much a total 180 from how I eat and train. But she is glowing, looks super thin and well darn it, should I go vegan? I know you’ve asked yourself similar questions, most women have! It’s this kind of thing that was part of Sarah Fragoso and my inspiration for creating a customizable diet and exercise template that a woman can start with but then learn to understand her hormone talk and tweak that plan to work better for HER. We’ll be taking a group of women through this exact plan starting VERY SOON! Learn more here. 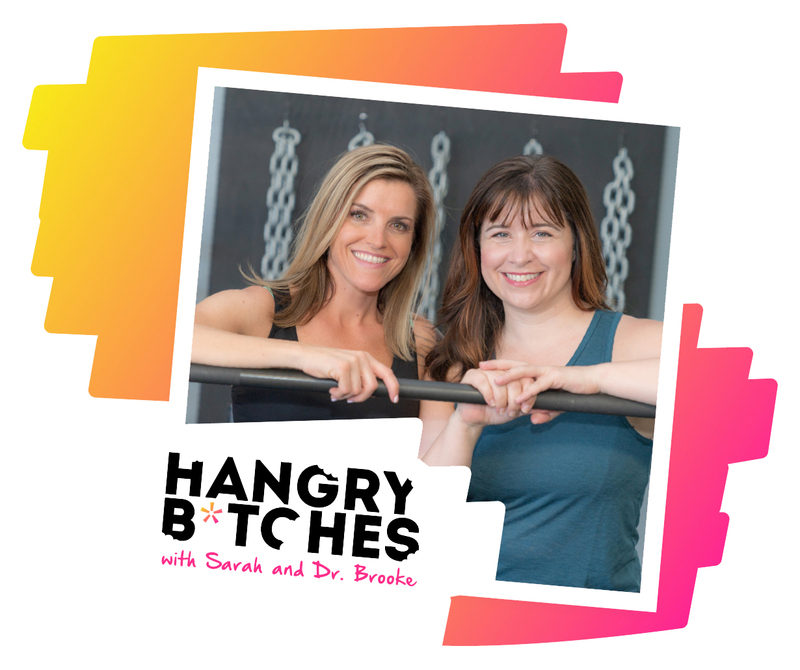 Hangry B*tches with Sarah and Dr. Brooke Starts January 16th! Our guide to mindset, nutrition, exercise and hormones… and most importantly, the information you need to make meaningful changes and habits that work with your body, not against it. It’s very normal to ask “should I be doing what she’s doing” if she looks and reports to feel amazing and you’re feeling frumpy, fatigued and frustrated. I’ve been at this a very long time now, but I’d be lying if I didn’t have that thought still from time to time – especially when I see a transformation like this! Now I haven’t see her labs (obviously wondering about her iron, B vitamins and protein), haven’t asked her about her period (vegan diets in my experience disrupt some female hormone issues while aspects of it can improve others) or her cortisol profile (curious about all that spinning) but can’t deny she looks fabulous right now. So is vegan the answer? For her, maybe. At least for now, this is clearly working for her (labs and period inquiries aside, I can’t TOTALLY take off my doctor hat!) and she is an animal lover so it suits her emotionally and spiritually as well. In the past when I actually was coaching her we did a Paleo diet (although she couldn’t give up her beloved Greek yogurt) and mix of interval training and strength training and she also did amazing. That was about ten years ago now and truth be told, she didn’t love protein then either but we got great results. But should I do it? Or should you do it? Whether it’s celery juice (covered in our most recent podcast!) or Paleo or CrossFit or Spin or a vegan lifestyle the question for whether or not you should do it is of course: how does this plan work with my current hormone issues? This is the crux of it and exactly why we wrote HANGRY – to give women the secret hormone decoder ring you should’ve received at puberty so you can understand what your hormones are telling you about your current plan: yah or nah? For me, a low protein diet is a disaster. I can’t control my appetite or cravings and I can’t help but eat ALL the carbs which leads to weight gain and breaking out. I also love me a good spin class, but that type of training – at least where I’m at right now with my hormones – drives my cortisol too high and I start to have an increased appetite, increased mid-section/belly fluff and have a harder time with my already tenuous sleep. I also LOVE lifting weights! Hormonal benefits aside, mentally it makes me feel capable, strong and I show up regularly to do it because I enjoy it and without protein I struggle with stamina, recovery and holding on to my lean muscle. As a woman with PCOS and insulin resistance who’s also worried about aging, this muscle is priceless to me! Without adequate protein and strength training it’s really hard to keep it. You may not have PCOS or be in your 40s, but remember it’s muscle that is your metabolically active tissue, you need it! Evening knowing this about myself the inclination to jump to her plan because she looks so damn good is understandable. At the very least, her great results should raise the question: what would that look like for me? I don’t recommend jumping on a plan that worked for someone else assuming it will work for you but I do recommend asking that question and learning from her success, filtering it through YOUR unique hormone balance. High plant diet. From estrogen to insulin, this is a win for all of us. No sugar. Across the board, this is a hormone helping habit. No alcohol. This isn’t so much vegan as it is her personal preference in her 40s and it’s another big factor in her results. No dairy. This is such an inflammatory and hormonally active food for so many of us, so there’s a big benefit here too. Joy. She feels like this diet is in alignment with her soul, that makes her happy. Now we can find joy other ways and keep our protein, but the point stands that this is a key element! This is another key aspect to the program Sarah and I have created that we teach via the 5 Pillars our mindset framework to lower your stress and help you find your joy because that’s great for your hormones! My friend is happy, feels and looks great, we don’t want to ignore that data. This diet is giving her great results, that’s the truth. But don’t ignore your own data either: does this work with your current hormonal landscape, lifestyle, preferences, joy, etc.? There’s at least five ways to think about any super food, diet, exercise plan, etc. Nothing is a silver bullet and NOTHING works for all of us! Taking my data into account I’m not signing up for spin or a vegan diet today. But I want us all to remember always that our hormones will change and we need to be able to roll with that, adjusting as needed and being willing to let go of something that isn’t working and pick up something new that helps. This is what keeps me going ladies, helping you find what works for you – and this is exactly what we teach in the HANGRY book and our Hangry B*tches program. So whether you’re raw vegan or full Paleo keto, we can help you better understand how your hormones feel about your plan and how you can adjust to do better! Not too late to join us but it will be soon – we start Wednesday!